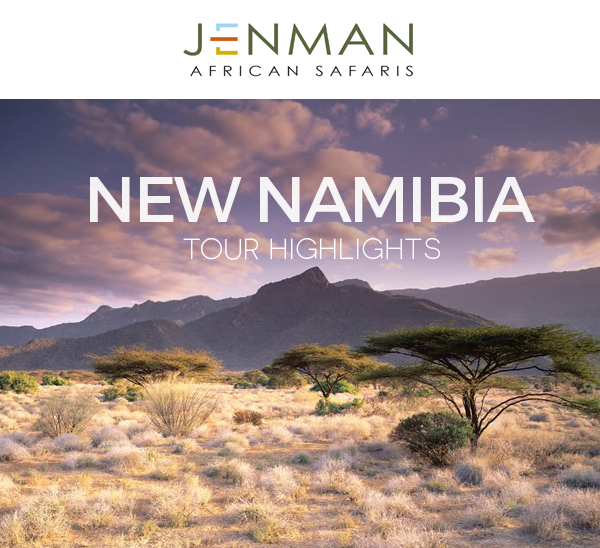 There are so many amazing attractions in Namibia that visitors to the seemingly boundless country are absolutely spoiled for choice, from Etosha’s unparalleled wildlife, to the largest seal colonies in Southern Africa, to some of the continent’s most significant rock paintings. There's just so much on offer! We've scouted some wonderful new highlights for our Northern Experience, Southern Experience and Northern Explorer tours. One of these new destinations is a small boutique winery that also produces some interesting spirits, a tasting and a tour of the Kristal Kellerei farm is not to be missed. Those searching for a white elephant can now find it in Philip's Cave, a San Rock Art treasure trove waiting to be explored! In 2018 the above highlights will be standard on our Northern & Southern Experience Tours as well as the shorter ‘Skies’ versions. 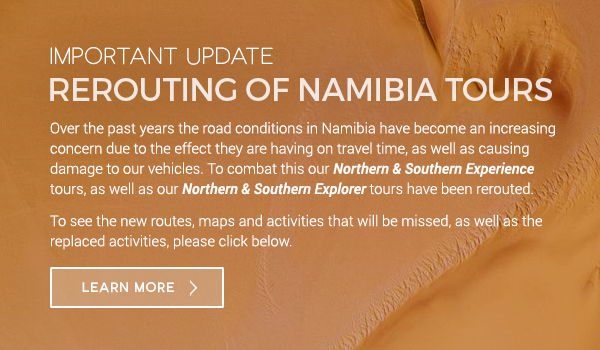 However, due to the severe road conditions in Namibia, we have decided to change the routing for these tours for the remainder of 2017. Many of the roads to popular tourist sites are currently in poor condition and this has affected travel times as well as damaging the vehicles in some cases. These new attractions ensure that guests still get the most out of their Namibian holiday while traveling safely, comfortably and pleasantly. Find out the facts in the next article. 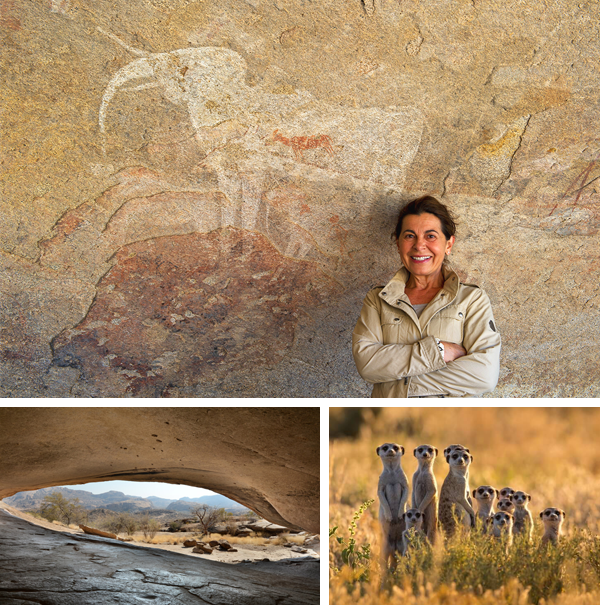 Don’t miss out on this exciting new special that combines some of the most sought-after highlights of Southern Africa in one 9-day holiday whilst only paying for 6! Clients will start their safari in Cape Town, South Africa, one of the world's top tourist destinations, before travelling up north to experience the majestic Victoria Falls in Zimbabwe. The safari highlight of this journey will be a 3-night stay in the famous Hwange National Park whilst enjoying true Zimbabwean hospitality and offerings at Elephant’s Eye, Hwange. Cellars-Hohenort Cape Town – 3 nights and breakfasts. Vic Falls Safari Club – 3 nights and breakfasts. Elephant’s Eye, Hwange – All meals, water, soft drinks, beers, ciders, mixers and house wine, 2 game activities (game drives or game walks) or 1 full-day game drive inside Hwange National Park per day, transfers from Hwange Airstrip, return transfers from Vic Falls, CWF Conservation Levy and laundry. Park fees (Paid locally on entry to Hwange National Park). All other transfers not mentioned above. Validity: 1 October 2017 – 20 December 2017, standard terms and conditions apply. *This special cannot be used in conjunction with any others. Receive an incredible 10% or 15% discount on selected departure dates of our most popular Guided Group safaris, including the Botswana Wildlife Breakaway, Botswana Lodge Explore, Northern Experience and Northern Explorer tours. 10 or 15% Discount per person tour price on our selected departures for Botswana Wildlife Breakaway, Botswana Lodge Explorer, and Botswana Untouched Tours - Excludes all other Southern Africa, East Africa, Madagascar scheduled tours, tailor-made, private guided lodge safari & packages. 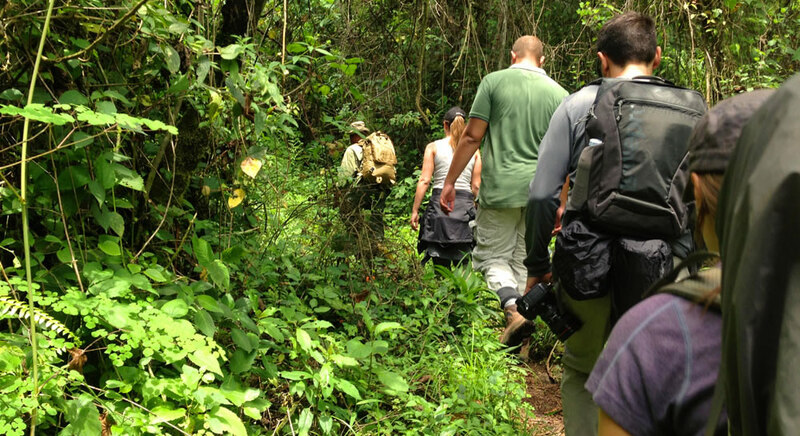 Jenman guides are a vital component of clients' African holiday experience. Not only do they need to be knowledgeable, organized and passionate but their personality and attitude go a long way. A good guide can really make or break a trip. We pride ourselves on working with the best of the best, and nowhere is this more evident than in the glowing reviews we receive from clients. 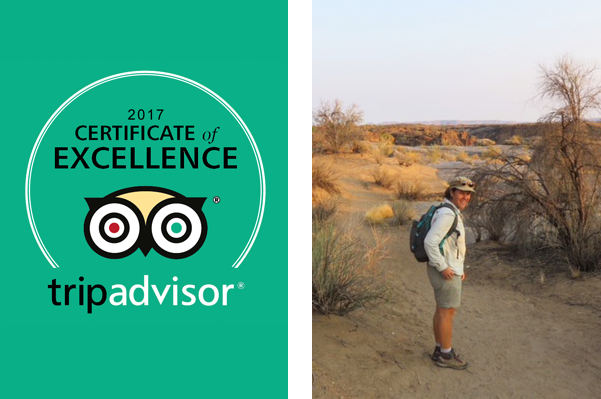 Nerise is one of our guides who consistently gets the highest praise, a recent client described her as "the best guide that I have had on any tour, period." We spoke to her to find out what makes her tick and learn why she is so passionate about her job. For those who haven’t heard, we've recently moved our Vic Falls office! 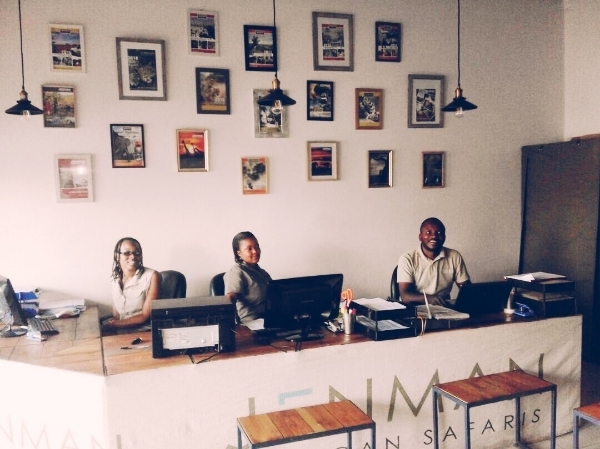 Our new centrally located premises will serve as a booking centre for all Victoria Falls day trips whilst also forming the base point for all our guided group and tailor-made safaris travelling through the area. Furthermore, its new location is conveniently located in the centre of town just a stone's throw from two fantastic restaurants, Mama Africa and well-known The 3 Monkeys. The office is now incredibly easy to find and a pleasure to visit. ROSMEAD’S CHILDREN GET AN EXCITING DELIVERY ALONG WITH A NEW SANDPIT! In our last newsletter, we told you about the tyres that the Jenman staff painted for the children of Rosmead Primary School. Now, we are excited to tell you that the tyres have been delivered to the school children and the visit coincided with the unveiling of the new sandpit that we built as part of our goal to upgrade the outdoor play area for the children. 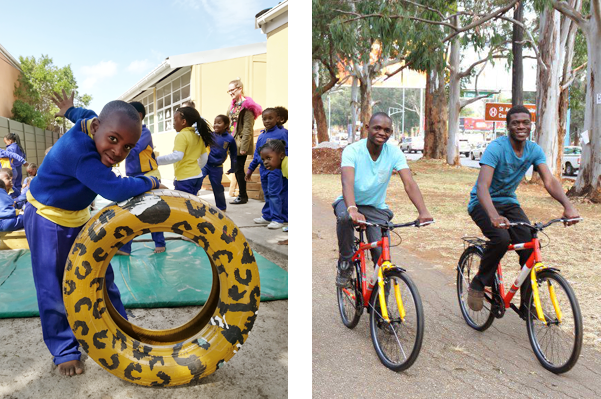 Besides being a source of joy to the children the brightly painted tyres also provide excellent developmental benefits. Their gross motor skills, as well fine motor skills are being improved with these fun resources provided by the Grow Africa Foundation. Deputy Principal Ian Kriel says "It's all learning, big play affects little play". Grow Africa recently arranged the transport of 12 bicycles from Cape Town, South Africa to a women’s charity in Harare, Zimbabwe. The Grow Africa Foundation was able to do this free of charge through its partner Jenman African Safaris. The Hope Ignite Zimbabwe Trust is a Zimbabwean charity based in Harare that aims to help local women and young adults to find employment. Hope Ignite Zimbabwe Trust does additional work in the local community, where volunteers bring food packages and other support to families in need. The volunteers use the donated bicycles to help with these projects, cycling around and bringing joy to the families they visit. In 2018 there will no longer be a discounted low season rate for gorilla permits and the rate of $600 will apply throughout the year. The months of April, May and November are considered low season and a discount of $150 was previously given during this period. An official announcement still needs to be made by Uganda Wildlife Authorities but agents and tour operators should start planning ahead as this will affect trips already booked for the low season of 2018. Gorilla permits are limited and highly sought after which makes it necessary to book advance. Jenman African Safaris has been offering these thrilling gorilla encounters on their Highlights of Uganda and Uganda Gorilla Adventures tours since 2008..